A commuter in his 20s got a fresh lease of life after he was saved by an alert policeman at Panvel railway station in Mumbai on Monday. CCTV footage of the railway station showed the man trying to board the train as it was leaving the station. The man it seemed was unable to hop on to the train as it gained speed and was dragged on the edge of the platform. Railway police personnel jumped and pulled him back in the nick of time. Passengers rushed in and supported the policeman. 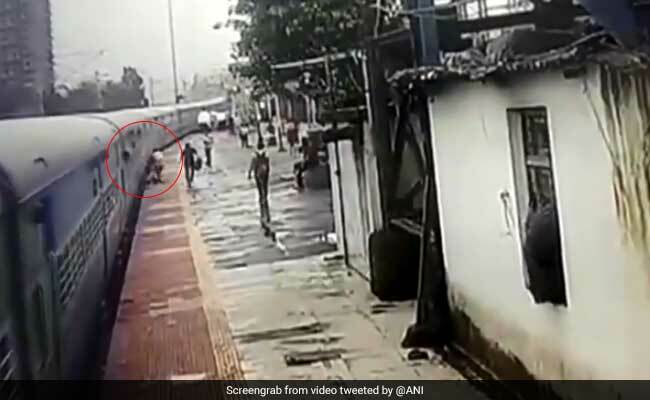 On February 5, a seven-year-old boy was saved by a constable from the Railway Protection Force in Naigaon railway station in Mumbai. The constable Sunil Kumar Napa's swift action saved the boy from slipping into the small gap between the train track and the platform. CCTV footage showed that the boy, who was with his mother, trying to board but before he could the train started moving and he slipped and fell. His mother was already inside the compartment. Constable Sunil Kumar Napa, who saved the boy, was awarded for his brave and timely act. Earlier a 22-year-old Marathi stage and television actor Praful Bhalerao, died in a similar situation when he tried to hop on to a moving train. Mumbai trains, which are the lifeline of the city, see as many as eight accidents per day. According to the numbers of the Government Railway Police, over 3,000 people have died in train accidents in 2017.